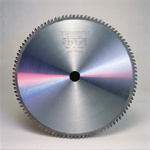 Application: For smoother cuts, especially in thinner materials. Specially designed, top-quality, micrograin carbide tips, honed to a precision edge with 600 grit diamond wheels cut clean and easy. High-grade, fine grain carbide tips for long life.